College scouts who live and work in your area. Unlike most other scouting organizations, we personally scout and interview every prospect at NSR before we consider accepting them for enrollment. 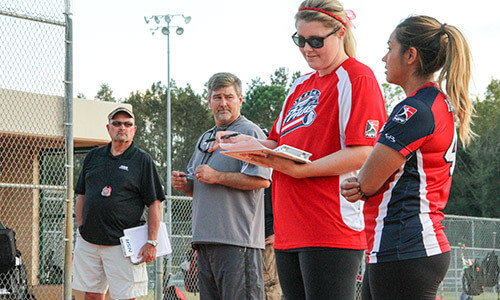 Our scouts are highly trained and motivated to help high school student-athletes succeed. Some have backgrounds in college, high school and club coaching. Others have been professional athletes, college athletic directors, Olympic athletes and business leaders. In every case, however, they are thoroughly interviewed, carefully selected and well trained before hitting the ground. When researching scouting companies, you will discover that there are some which do their scouting and evaluations by phone from a central office a thousand or more miles away from the prospects. They are selling a recruiting program without really scouting. We do not believe in these "boiler room" sales tactics even if their representatives have been given a title like counselor, recruiting coordinator, or advisor. In reality, they are merely sales people working on commissions that they receive when they sign up someone (anyone) on their program. They will enroll anyone who has the money, qualified or not. Once you pay your money this is the last time you see anyone from this company. Everything from this point on is done by email or phone. To state the obvious, telephone scouting from a central office by high-pressure salespeople is not the way credible college athletic scouting is done. Some scouting companies provide services that are heavy on advice and very light on actual exposure. It sounds good, but it won't help you get recruited. And, of course, their program is designed this way because it is cheaper to perform and more profitable for them. NSR, on the other hand, will stay with you for the duration of your high school athletic career. Your personal scout lives and works in your area. He or she goes to the games, matches or meets and personally scouts other prospects from your area. With NSR, you will have a hands-on person to go to when you need help or advice. If you need a one-on-one meeting, your scout can oblige. And, perhaps more significantly, college coaches have someone to talk to who really knows you and has personally scouted you. It's not hard to find out which companies are good, which ones are not, and which one is the best. Do your own comparing. Check out each company with the Better Business Bureau. Compare the promotional and exposure services of each and compare the backgrounds of all the companies. Then, ask yourself this key question: If you were a college coach looking at two equally talented prospects with similar grades, size and other attributes, one was enrolled with NSR program and the other was enrolled with another scouting service, which one would the coach be more likely to recruit and make an offer to? NSR. You are either at the front of the pack, or you are back with all the others who are hoping and wishing that a college coach will find them. There are thousands of prospects across America and around the globe competing with you for a scholarship. Some are more talented, some less so. In any case, there is one thing for certain: you will want to make sure you grasp every advantage available to you. You will only have one chance in your lifetime to get recruited and you cannot afford to make a mistake that will let your dreams slip away. Choosing the best, most effective option for your particular needs is a critical decision. Comparing apples to apples, we are confident that NSR will stand out in terms of value, quality and results. No other option comes close to what NSR can do in comprehensive exposure services, college coach credibility, past success and reputation.